The WS2000 Wireless Switch is a market-leading powerful all-in-one solution that simplifies and reduces the costs of managing wired and wireless (802.11a/b/g) networks in enterprise branch offices. The integrated router, gateway, firewall, Power-over-Ethernet (PoE) and more eliminate the cost of purchasing and the complexity of managing multiple pieces of equipment. The ability to easily and cost-effectively scale to meet growing needs, as well as upgrade to support new security, radio and other standards provides the assurance that the WS2000 will meet your needs today and tomorrow. If you were going to install three or more AP-5131's then you should go for the WS2000 since instead of having to configure each AP-5131 individually you can just program the WS2000 and it will configure the AP300's for you (one WS2000 can have 1 to 6 AP300's connected to it). Enhances performance and functionality; simplifies deployment/management, protects your investment and reduces TCO. Reduces costs with flexible radio support. Enables voice/video applications with wired QoS extension support and efficient power management..
Controls the number of active SIP sessions that are initiated by a wireless VoIP phone. Enterprise-class authentication and encryption; ensures privacy of data during transmission. Ensures robust network redundancy through multiple links. Eliminates the cost/need for a separate RADIUS server. Eliminates the need to purchase and manage additional equipment with integrated secure gateway: routing, DHCP, NAT, Stateful Packet Inspection Firewall and WAN uplink (with PPPoE). Provides flexibility in defining access policies. Provides secure public access — complimentary or service-based. 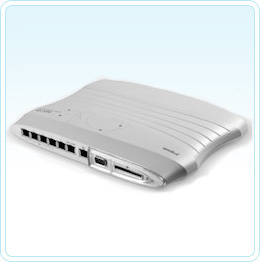 Identifies, reports, detects and disarms unauthorised access ports and points attempting to access the network. Integrated intrusion detection, prevention and anomaly analysis protect against threats to the network. Eliminates the need to power access ports and points, resulting in lower expenses overall. Enables visualisation of mobile clients with RF Management Software. Extends wireless in hard-to-cable areas by over-the-air bridging with other independent access points or wireless switches. Automatic healing of networks to account for neighbour recovery and interference avoidance. WS-2000-2ES-BG-WR (WS2000 and 2 AP300 (802.11b/g) bundle): Energy Star Compliant Wireless Switch SME solution. Wireless bridging/Mesh The WS2000 with the AP300 can operate as a base bridge and wireless bridge with the AP51X1 access Points for data backhaul in a mesh configuration, as well as provide both based and client bridge capability by operation as a mesh node itself. Plastic Enclosure - to keep dust and cockroachs out. Click on the 'More Info' button above for a page containing support, case studies and FAQ's on the Motorola wireless infrastructure.